Tens of thousands of migratory birds are facing starvation in South Korea, the UK-based Royal Society for the Protection of Birds (RSPB) says. The group claims a land reclamation project has destroyed key wetlands used by the birds on their way from Asia to their breeding grounds in the Arctic. 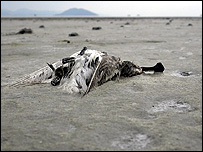 Without the food at the Saemangeum wetlands, on the west coast, many of the birds will not survive the journey. Two endangered species of wading bird face extinction because of the changes. 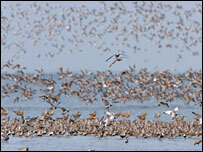 There are believed to be fewer than 1,000 mature spoonbilled sandpipers and Nordmann's greenshanks left in the wild. The RSPB and other wildlife and conservation groups are highlighting the environmental problems at Saemangeum to mark World Migratory Birds Day. Saemangeum was once an estuarine tidal flat on South Korea's Yellow Sea coast. It was an important feeding ground for about 400,000 migrating birds making their way on a 24,000km round-trip between Asia and Alaska and Russia. But 15 years ago, the government revealed plans for the world's biggest land reclamation project in order to drain the estuary and create fertile paddy fields. After a succession of legal challenges from conservationists, the 33km sea wall was finally closed a year ago. Since then, according to the RSPB, the vast wetlands have been replaced by parched earth, shellfish beds and plants have been destroyed, and thousands of birds are starving as a result. "What we've lost here is one of the jewels in the crown of wetland habitats," Sarah Dawkins, who is monitoring the impact of the sea wall on birds, told the BBC. "The Yellow Sea is an amazingly important stopover point for birds travelling up from places like New Zealand and Australia to their breeding grounds in the Arctic. "And Saemangeum was one of the most important areas in the Yellow Sea." Ms Dawkins said the birds relied on the tidal flats at Saemangeum as somewhere where they could land and "refuel" after a nine-day flight from New Zealand. "It's a bit like losing a motorway service station and then your car running out of petrol," she explained. Despite the damage, Ms Dawkins said there was still hope for the wetlands if the two sluice gates built into the sea wall were opened. "That would restore a few thousand hectares of estuary system within Saemangeum and that would be at least something to help the birds," she said. "The birds are still here. They're still coming." "I think we really do need to still try to save some of their habitat." Ms Dawkins also said it was critically important to mount a global effort to safeguard other estuaries around Saemangeum, one of which the government is planning to reclaim.